Pro Tour Champion Patrick Chapin joins Resident Genius Michael J Flores for the second episode of Top Level Podcast! In this episode the intrepid duo cover a variety of topics, both Butcher of the Horde-related and not-so-Butcher of the Horde-related. A style of deck design you might not know about but that has taken down multiple Pro Tours! 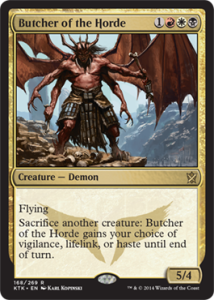 A discussion of some very good cards that are all relatively similar in power level… How do you pick between Crackling Doom, Hero’s Downfall, Banishing Light, and Utter End? Magic: The Gathering Pro Tour Hall of Fame member and Pro Tour Journey Into Nyx champion Patrick Chapin is joined by Resident Genius Michael J Flores for the first Top Level Podcast! The first of infinite. Der infinite. In this episode Patrick and Michael touch a little bit on Patrick’s recent play of Abzan on the Pro Tour and a Grand Prix, plus his preparation for the 2014 World Championships. 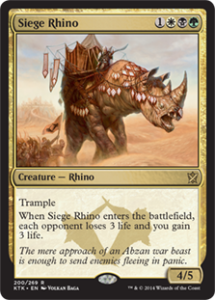 The focus on this podcast is Abzan decks in Standard, and Siege Rhino in particular. Want to hear more from these guys?